Such is the story of the birth of the Tyne Tees Tigers Australian Rules football club in the north east of England. 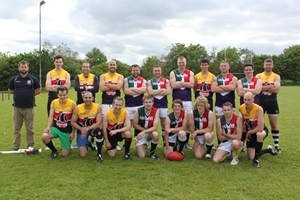 The gathering of Ian Baxter, Anthony Nolan and Shaun Bulmer to pursue a means to keep their favourite sport alive in the region has led to the Tigers having served a local “social club” apprenticeship, and they are ready to join the AFLCNE (Australian Football League Central & Northern England) for the 2014 season. Whilst not technically a “new” team, as they have been in existence in one form or other since 2007, they are quite definitely a new club in a variety of ways. “We started in 2012, just training in Newcastle with a small group of players from the previous Gateshead Miners. We were playing matches in the autumn/winter with the occasional ring-in from players who had played before in Hartlepool." “The Tigers are a regional representative side and we will be competing in the AFLCNE (Central and Northern England league) as of next season, 2014. We will draw on players from our two constituent clubs, the Newcastle Miners (we kept the old Gateshead name [Miners] to reflect the players that had come from that team) and the Hartlepool Dockers." It is pleasing that the AFLCNE will boast another club in its ranks, but the Tigers are not turning their backs on the localised competition from which they have grown. They will continue to stay true to the feeder clubs, both current and historical, which have provided the bedrock on which the Tigers now exist. 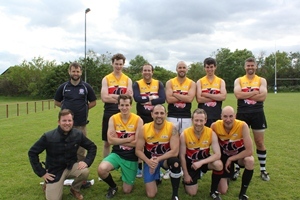 The Tyne Tees Tigers will be a welcome addition to the AFLCNE, and the wider community of Australian Rules football across England and, indeed, Europe. Ian and his crew will continue to develop their team by seeking sponsorships, developing a wide range of community links and simply training these players to be a force to be reckoned with from round one next year. Good Luck to the Tyne Tees Tigers. Photos courtesy of Zoe Vicarage. This is brilliant news for footy in England. Ian Baxter has done a remarkable job resurrecting the game in the north-east of the country! 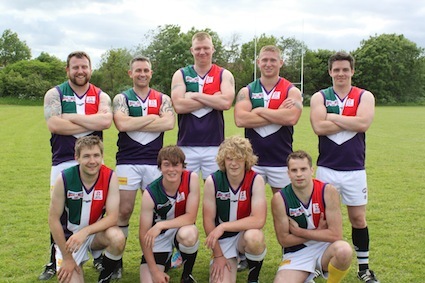 Updated with a photo of the Hartlepool Dockers.